I’m constantly trying to find new ways to invent pizza. I will put toppings, cheese and sauce on just about anything and call it pizza, because I love it so much. Last night was Pizza Panini’s. I went vegetarian but the guys added pepperoni on theirs. It was so delicious when the cheese started to melt and combined all the flavors in between. 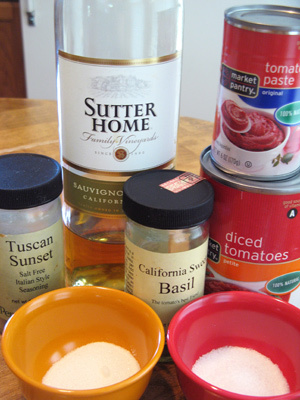 The marinara sauce has some diced tomatoes, paste for thickness, white wine, salt, sugar, sweet basil and some Tuscan Sunset. Tuscan Sunset is an Italian herb blend of basil, oregano, garlic, thyme, and fennel. Whatever Italian herb blend you have in the spice pantry will work just the same. Dice 1/2 sweet onion and mince 1 clove garlic. Drizzle olive oil in a pan. 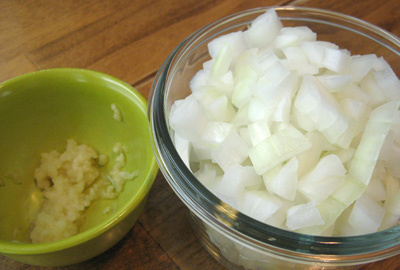 Heat oil and add onion. 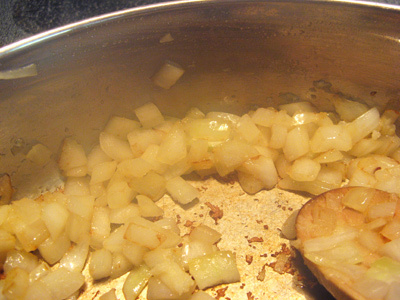 Saute over medium heat until onion becomes translucent. Add garlic and stir 1 minute. 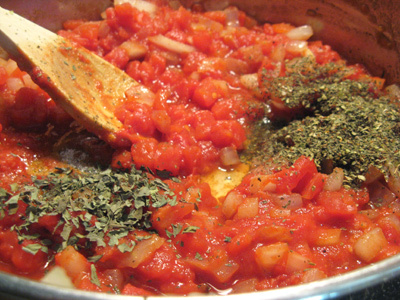 Add the tomatoes, paste and spices. Give it a stir. Add white wine and continue cooking for 3 – 4 minutes more. Remove from heat and let cool to room temperature. Make sure the sauce has cooled down. 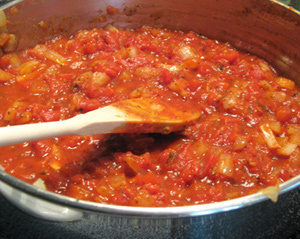 Then place sauce in a blender and puree until you have a nice thick consistency. 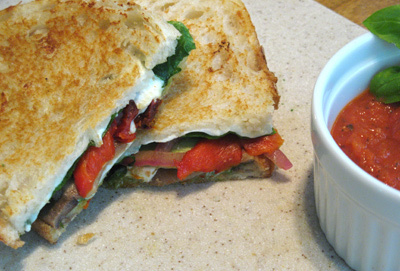 Pour back into the pan and turn heat on low to keep the marinara sauce warm while we put the Panini’s together. For these panini’s I wanted a nice sourdough bread. 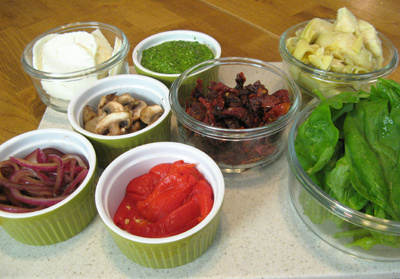 Toppings include fresh mozzarella slices, spinach pesto, sun-dried tomato, artichokes, fresh spinach, roasted red pepper, red onion and mushrooms sauteed in balsamic vinegar and olive oil. Spread a thin layer of pesto over sourdough slice. 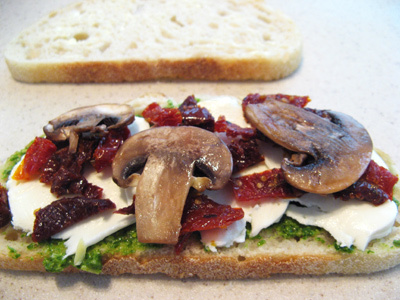 Add fresh mozzarella, sun-dried tomato and mushroom. Add a a couple quartered artichokes, red onion and red pepper slices. 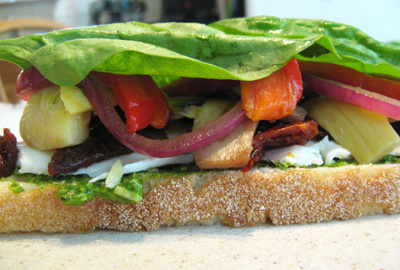 Place fresh spinach leaves over all that goodness. 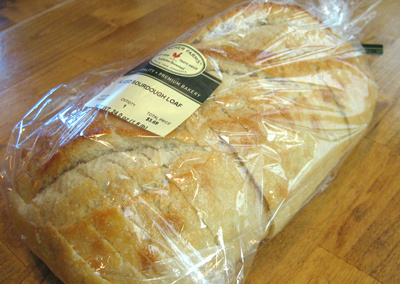 Lightly butter or use cooking spray onto outer sides of bread. 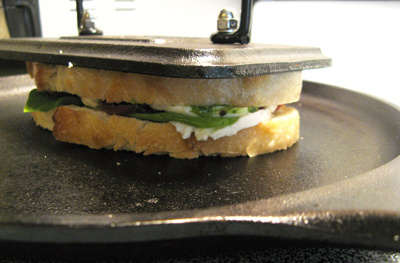 Place on a heated grill pan or flat griddle and place a press on top. You will start to hear it sizzle after a couple minutes. Check on it and when it has turned crisp and brown, flip it over and press again. When I didn’t have a press, I got creative and used 2 cast iron skillets. I placed the Panini in the larger skillet and placed the smaller one on top. It was heavy enough to press the sandwich down. The cheese has melted and all the veggies have merged together. 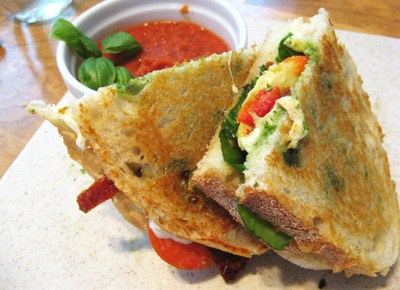 Dip it in the marinara sauce and you’ve got a Pizza Panini. 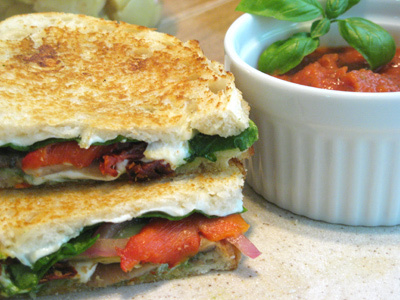 To assemble Panini, take 2 slices of sourdough bread, spread a layer of pesto over one slice of sourdough bread, add 2 – 3 slices of fresh mozzarella. Arrange a light layer of sun-dried tomato, mushroom, onion, artichokes, red pepper and just enough spinach leaves to cover toppings. 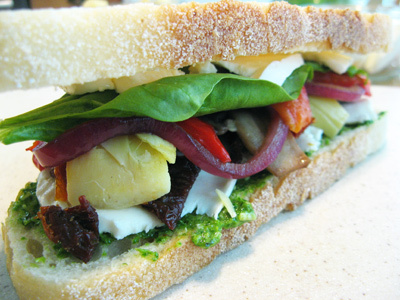 Top with another 2 – 3 slices of fresh mozzarella before covering with sourdough bread. 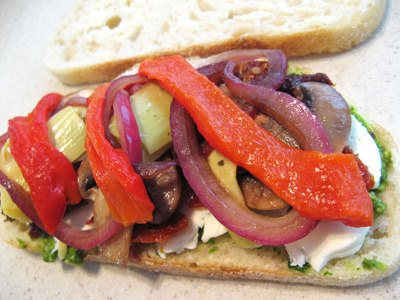 Note: Don’t overdo the toppings, a little will go a long way when the sandwich is pressed together. Lightly butter or use cooking spray on both outer sides of the bread. Over medium high heat place sandwich butter side down on a hot grill or flat griddle pan and lay the press on top. When sandwich is crisp and brown, turn over and cook a few more minutes. When cheese has melted and sandwich has browned, remove from heat and cut in half. Serve with Marinara Dipping Sauce. **Note: I sauteed the Red Onion in 1 T Balsamic Vinegar and 1 T Olive Oil. After removing onions I added Mushrooms to same pan and sauteed a few minutes until softened. Over medium heat drizzle olive oil in a pan, add onion and saute until onion becomes translucent. Add garlic, cook 1 minute more. Stir in diced tomatoes, paste, spices, salt and sugar. Add white wine and continue cooking 3 – 4 minutes more. Remove from heat and let stand to room temperature. 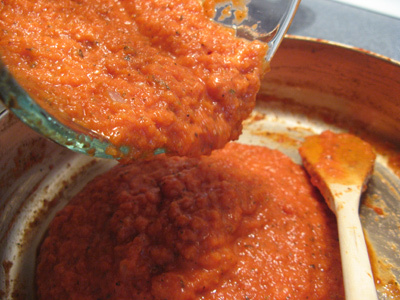 In a blender, puree sauce into a thick consistency. Pour back into pan and simmer for 15 minutes.